London Mayor Boris Johnson met British troops assisting Kurdistan against the Islamic State (IS, formerly ISIS/ISIL) on Thursday during a surprise visit to crisis-ridden northern Iraq. The Conservative mayor posed for photographs holding an AK-47 on the frontline, where British troops are helping Kurdish fighters battling Islamists. He also met with UK officers who are training Peshmerga fighters, the improvised military of Iraqi Kurdistan. The mayor’s visit was prompted by an increased threat level in London, following the Paris terror attacks. Accompanied by the Sun newspaper’s political editor, he attended specially scheduled talks in Kurdistan’s capital, Erbil. Erbil was formerly regarded as a secure and stable city, but has recently been threatened by IS militants. At one point, the terror group succeeded in annexing territory a mere 18 miles from the city. Johnson said he made the journey to Kurdistan to highlight London’s position as an operating ally in the war against the Islamic State. Britain’s consul general to Kurdistan, Angus McKee and Conservative MP Nadhim Zahawi, also accompanied Johnson on the trip. The mayor had talks with Kurdish Prime Minister Nechirvan Barzani, regarding the prospect of enhancing UK-Kurdistani trade links. He said close ties were developing “at an incredible pace” between Britain and Kurdistan and he looked forward to discussing greater cooperation in the future with the region’s progressive leadership. Johnson added UK and Kurdish authorities have a shared interest in the security and prosperity of Kurdistan and Iraq. The House of Commons Foreign Affairs Committee says Kurdistan is a “beacon of tolerance and moderation” in an area characterized by extremism and instability. 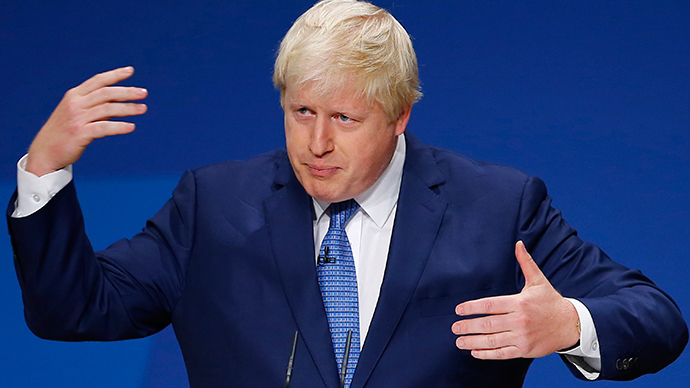 Johnson’s absence from London coincided with discussions in the capital regarding the threat IS poses internationally. The discussions, held on Thursday in London, were hosted by Foreign Secretary Phillip Hammond and US Secretary of State John Kerry. Foreign officials from 21 countries discussed a coordinated international effort to halt the progress of the Islamic State. On Wednesday, IS militants detonated a series of explosives at key buildings in Shingal, a Kurdish Yezidi town in northern Iraq. The terror group had reportedly come under heavy fire from Peshmerga troops. While the Islamic State still controls much of northwestern Iraq, Iranian-funded Shia militias have begun to reclaim some territory and are reported to be north of Baghdad. The Kurdish Peshmerga troops successfully re-captured the Mosul dam in August last year. In Syria, however, airstrikes haven’t managed to oust IS from Raqqa, nor halt their influence in neighboring areas. Johnson’s visit to Kurdistan will likely be interpreted by his critics as a PR campaign to bolster his foreign policy standing in a bid to secure further political ambitions. The Mayor’s trip to northern Iraq comes in the wake of reports he has finally agreed to pay a US tax bill amounting to thousands of US dollars. As Johnson was born in America and holds dual citizenship, he is obligated to pay a certain amount of tax in the US. Johnson, tipped as a frontrunner in the next Tory leadership contest, sold his home in Islington for £1.2 million in May 2009. The Financial Times estimated he would have faced a US tax bill of almost $44,000 (about £29,000) on the sale, assuming he and his wife shared ownership of the house. The London mayor previously said he would not pay the tax bill when he first revealed his predicament last November.